In case you’re not sure why you want a mission statement, I’ve got 10 reasons why…just click on this link to read them. Mission statements are so valuable, and they aren’t just for businesses anymore. A mission statement is something that needs to be revisited from time to time, but the great thing about it is that once you’ve done it once and have the basic framework in place, it is easy to update and tweak as life necessitates. If writing a mission statement seems overwhelming, no worries, I’m here to help. I feel a mission statement should be broken down into two parts. The first part is focused on creating a realistic foundation on which you will be building your mission statement. If you try to write a mission statement and have not laid this foundation first, you’re likely to fail at many parts of your mission statement. Once you have your foundation laid, you’re ready to move forward with creating the vision portion of your mission statement. Think of it this way: the first part of your mission statement is focused on taking a realistic look at where you are while the second part of your mission statement is all about where you want to be. 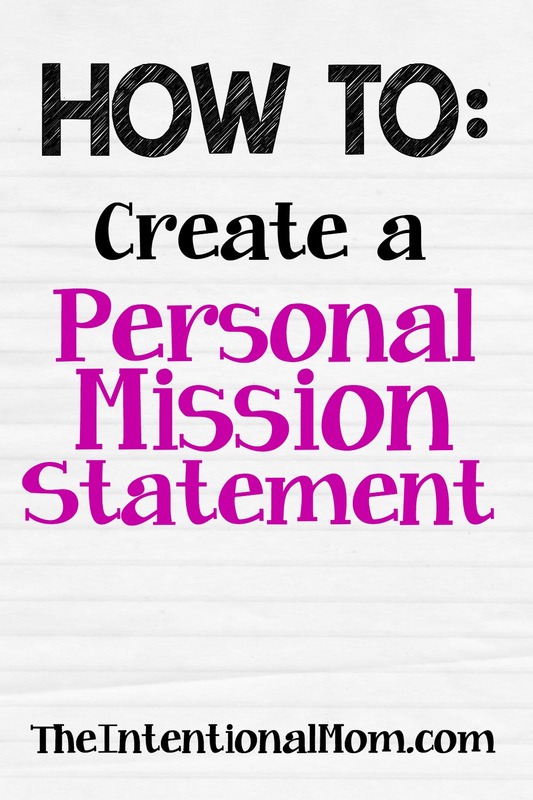 Now that you know the basics about how a mission statement is structured, let’s get on to how to create one. Mine would include wife, mom, homeschooling mom, and working mom. At times I am a daughter, sister, and friend among others, but since these are not part of my daily routine I’m not including them here. What are your regular responsibilities? Mine would be to care for my home and family, to meet work demands and deadlines, handle the finances, create the shopping lists, and driving my kids around on a daily basis. Because these are things that all happen every day, I list them as my responsibilities. What is your current season? Are you a mom of little kids? A single mom? Married but without kids? Building a business? In work for yourself? Struggling with health? 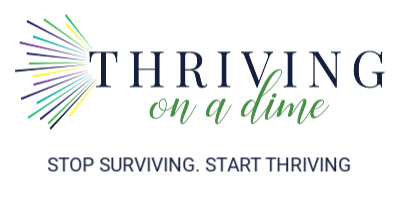 Struggling with finances? In school? All of these and many more would be important enough to include as part of the foundation you are putting in place for your mission statement. These things will comprise much of the context from which you write your mission statement. What are the regular demands on your time? My time is largely not my own in this season. Almost all of my time is spent fulfilling my roles and responsibilities because of the season I am currently in. 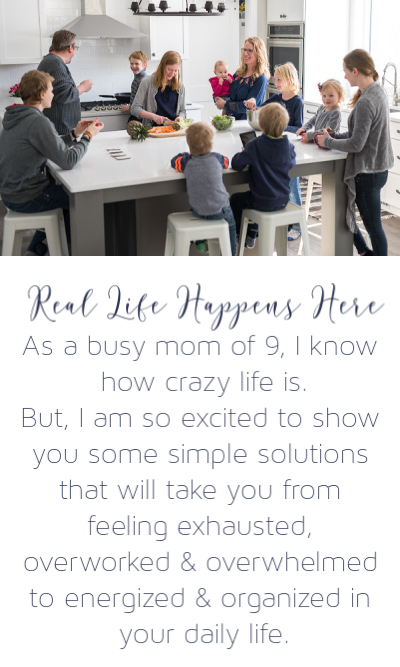 My season is largely spent as a single mom right now as my husband is in a busy season of work and school, which therefore greatly defines my season as his wife. Next, we need to move on to the vision section of your mission statement. Answer these questions. What are the three things you’d most like to accomplish this year? What about in the next five years? The next 10 years? Who do you want to be? In what three ways would you like to improve who you are today? These could be things like more intentional, more patient, more generous or giving. These are the kinds of things to include here. If you were to die tomorrow, what would you want your lasting legacy to be? What would you want others to say about you? After you’ve followed these steps, you’re ready to combine them to create your mission statement. I like my mission statement in paragraph form, but you may prefer yours to be in outline or bullet form. In the everyday hustle and bustle of life, I will place my family in the forefront of everything I do. Even while driving kids around, folding yet another load of laundry, and making yet another meal, I will choose to be intentional, to be understanding and patient, and to be fully present in the moment – even in those moments when my soul is longing for just a little bit of peace. While raising kids who are strong, resilient, and responsible, I will continue to love their father and together we will face and weather the storms that come our way. Through fostering my own sense of independence and spending time doing the things that make my soul sing, I will continue to strive to inspire and help others embrace the truths I have learned, especially those that I’ve learned the hard way. I will forever pursue being a blessing to those around me, even when life is hard. I will find the balance between being efficient and productive while also being still and making the time to enjoy life along the way. In everything I do, I will continue to pursue my relationship with Jesus Christ and exemplify what it truly means to be His hands and feet. No matter what the future holds, I will give each and every moment my all, savoring the moments I am given whether they are many or whether they are few. I will make each day count and offer love, compassion, and understanding to all who are within my reach. It did take me a series of days to write mine, so don’t feel the need to rush. As times change, seasons change, and roles and responsibilities change, be sure to adjust your mission statement as needed. I suggest keeping it someplace where you will see it often. I keep mine hung in my office and also written in my planner. Create your mission statement just one step at a time, but it will be something you will appreciate having. The time you spend will bless you and your family in numerous ways. Mission statements aren’t just for businesses, they are for anyone who wants to make their moments count. « Amazon Deals – Steam Mops, Alex Crafts, + More!